Simon: Thanks Mike for thought provoking quotes about the Czech Pavilion Quote on illusions. Freeing ourselves from situations which demand illusions, sounds a bit utopian, even totalitarian to me; interesting that this comes from Kafka’s land. Illusions are like power, in that they cannot be banished or overcome; nor the situations that create them, these will always exist, but they can be understood in a specific context and worked with. As Zizek writes, the greatest illusion is that we are free from ideology and illusion. His example is that today, illusion becomes the reality we enact, (even when we know it’s an illusion we continue as if it’s real). The task is not to unmask the false illusory world, to find the pure real, as this doesn’t exist. The task is to understand the libidinal economy that sustains the illusion, and then work with this. Mike: I think you miss the point. I have not read Zizek and having explored what he may have written I think I disagree. For me there are illusions plus assumed realities that trigger illusions (that I think Jiri David is pointing out, for me they include everyday work, family, ie when you get up in the morning, cooking breakfast, I’m Australian, or not etc) and what I think you and Philip Boxer might be exploring, the cathexis of energy from, let’s call it libido, that I unconsciously invest into an object that might exist that I have illusions about also. These are only three layers that may exist which are fun to explore. I do not think we can get away from any of them. I am attracted by Jiri David’s idea, let’s explore the middle one too, the situation that some call reality. unconsciously-invested-in objects that might exist, and about which the subject also has illusions. A fourth layer reflecting the possibility of many different vertices, each vertex representing a different way of organizing the ontic assumptions built into an illusion. (In Bion, the ‘scientific deductive system’ reflects the modernist assumption that a ‘true’ understanding would emerge from scientific processes of inquiry that eschewed memory and desire.) Each vertex constitutes a particular form of ‘Thirdness’, C.S. Peirce’s term for the way in which meaning is rendered performative. A ‘zero’ layer – Bion’s ‘thing-in-itself’, to-be-in-relation-to-which was an emergent effect of working in relation to what-is-going-on (wigo) without memory or desire. 1. In making the thinking in his ‘Project’ more accessible, Freud combined his distinction between thing-presentation and word-presentation as ‘object’ , which formed the foundation of the Kleinian object-relations. In Lacanese, it becomes crucial to preserve this structural distinction between the ‘open’ -complex of quantity and the ‘closed’ -system of quality. They are nevertheless entangled in the sense that every -pattern of distribution of quantity in the -complex has an -signature in the -system of quality. Bion tackled the relation to this radically unconscious  in terms of the relation to ‘O’, but he did so within the context of Kleinian reading of ‘object’. 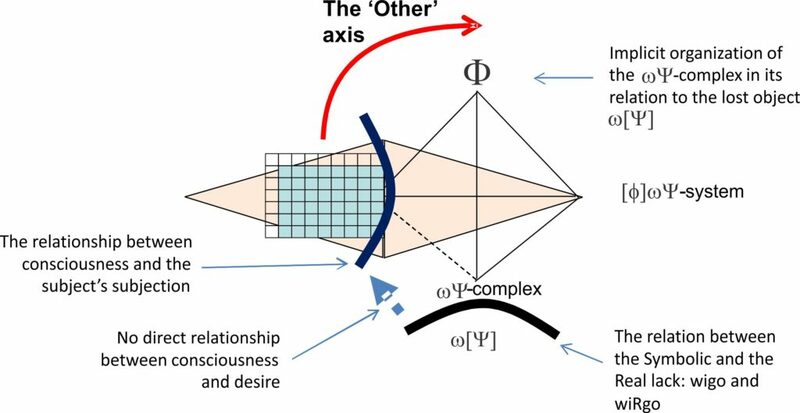 The relation between the ego and the Imaginary ‘other’ supported by the way exogenous experience  is further entangled with the -complex in the formation of the ego, shown here as a -system. We see the effects of this orthogonal relation in Figure 5 below. 2. This entanglement of quantity and quality means that an anticipation (an -signature) may not be able to be supported by a repeated experience (-pattern). We can represent this as the entanglement [], in which the [] represents the presence of an absence, an experience which the subject could not repeat. The original version of this lost object is the loss Δ of the -state-of-being-prior-to-birth, arising from the separation at birth from the mother. With Lacan, this ‘lost object’ [] or relation to Das Ding is taken up in the form of the objet petit a, the imaginary form i(a) of which covers over the lack/gap. This lack/gap is very specific to the subject’s -complex, and in its relation to the Real lack is the cause of desire (desire qua presence of absence, not to be confused with demand qua absence of [an expected] presence). Furthermore, the ‘open’ nature of the -complex, as a complex of chaining relations distributing quantity across it, means that this notion of lack/gap is dimensional in nature i.e. is a structural ‘hole’ in the -system. Figure 4: The Lacanian Che vuoi? – what do I want/lack? Hence ‘minding the gap’ aka the Lacanese manque à être is not an object-relation but rather a relation to something that remains beyond signification itself. In Lacanese, phantasy (aka Mike’s ‘illusion’) is a way in which the subject can live with these gaps in the impossible relation between $<>a. Figure 5: Lacan’s Quadripod and its effect on the subject’s relation to ‘the-thing-in-itself’. There is no direct relationship between consciousness and desire, the relation of consciousness to the unconscious being always mediated by the effects of the ‘closed’ -system. The relation to the Real – what-is-Really-going-on – is positioned as a ‘beyond’ of all this, a relation that is covered over by a libidinally-invested phantasy supported by jouissance (the $<>a). The implications of wiRgo here are that the effectiveness of the covering-over produces a supplementary or surplus jouissance (a plus-de-jouir) arising from the efficacy of this relation to that which is being discluded. The problem is not to free ourselves from illusions. The problem is to free ourselves from situations which demand illusions. Jiri David, Czech pavilion, 2015 Venice Biennale. For more on Thirdness, see To ‘contain’: signifiers, signifieds and Thirdness. For more on the relation to the Real, wigo/wiRgo, structural ‘holes’ and drive structure, see Structural ‘gaps’ – the wigo/wiRgo relation. This ‘quadripod’ forms the basis of the four positions in a Lacanian discourse: agent, truth, work and production. 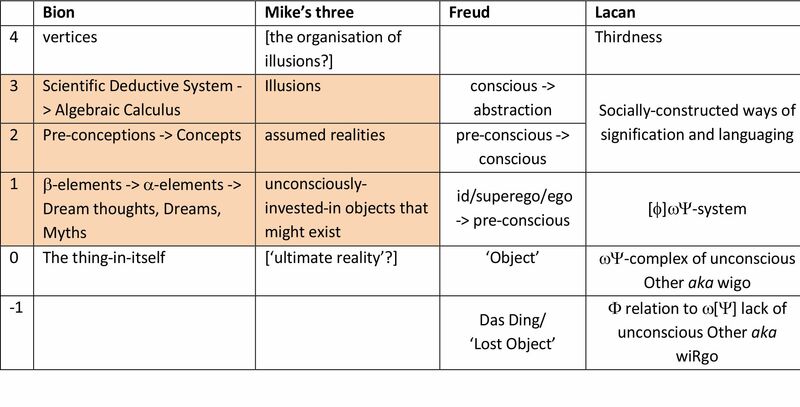 The quadripod is a way of understanding the structuring of a subject’s double subjection – Lacan’s reading of the implications of Freud’s Project. For more on this unconscious structuring of human being, see The Quadripod and Getting caught inside particular forms of Thirdness as an effect of unconscious valency. For more on the four positions of agent, truth, work and production, see The structure of a Lacanian discourse. When something is ‘discluded’, it is both dismissed and excluded. The word is introduced in Working forensically with toxic thinking: what doesn’t kill you makes you stronger, a paper presented at the 2015 ISPSO Symposium in Rome.